Of all the easy camping meals I make regularly, this is one of my favorites. I adapted it from a recipe in the wonderful cookbook The Enchanted Broccoli Forest. This takes a bit more work than most of my camping recipes, but sometimes I feel like making something special, even at camp. It feels absolutely decadent to eat this at a picnic table in the woods! I always use spaghetti in this recipe, but you could use any kind of pasta. Cook the spaghetti according to the package directions. Meanwhile, pour the liquid from the artichoke jar into the skillet. Cut the drained artichoke hearts into bite-sized pieces and set them aside. Add 2 Tbsp/15 mL olive oil and 1 Tbsp/15 mL butter to the skillet. Heat gently until the butter melts. Add the onions. Sauté until soft. Add the artichoke hearts and 2 tsp/10 mL basil. Sauté for another 5 minutes. Add 1 cup/250 mL sour cream, 1 cup/250 mL cottage cheese, and salt and pepper to taste. Drain the cooked pasta. Add it to the skillet. Looking for more great camping meals? If I am camping with a cooler (rather than in an RV with a fridge), I plan to have this on the first or second night out, when the cooler is still cold enough to keep the cottage cheese and sour cream chilled. Or I plan to make this on the day after a run to the grocery store. Feel free to leave the measuring spoons and cups at home, and just estimate the amounts. 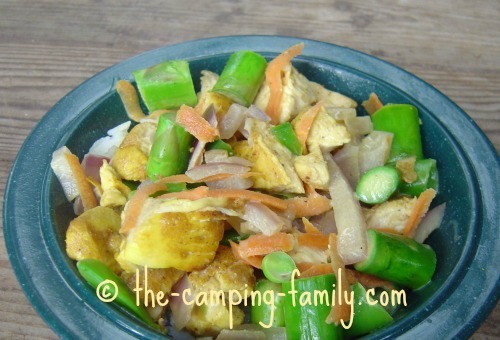 This is one of those easy camping meals where you can't really go wrong! If your camping skillet isn't large enough for mixing the pasta and sauce, you can either mix them together in a large bowl, or put each serving of pasta on a plate and then top with the sauce. 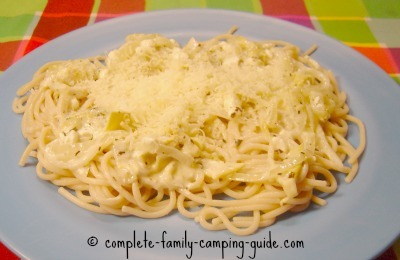 Now that you know how to make Pasta with Artichoke Hearts, visit this page for lots more ideas for easy camping meals. Click here to go to The Camping Family home page where you'll find helpful information about every aspect of your camping trip.